America’s next major war is likely to be provoked by a cyber attack. From well-covered stories like the Stuxnet virus, which helped slow Iran’s nuclear program, to lesser-known tales like EternalBlue, the 2017 cyber battle that closed hospitals in Britain and froze shipping crates in Germany in midair, we have entered an age in which online threats carry real-world consequences. But we do not have to let autocrats and criminals run amok in the digital realm. We now know a great deal about how to make cyberspace far less dangerous–and about how to defend our security, economy, democracy, and privacy from cyber attack. 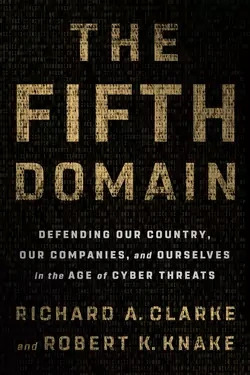 This is a book about the realm in which nobody should ever want to fight a war: the fifth domain, the Pentagon’s term for cyberspace. Our guides are two of America’s top cybersecurity experts, seasoned practitioners who are as familiar with the White House Situation Room as they are with Fortune 500 boardrooms. Richard A. Clarke and CFR Whitney Shepardsion Senior Fellow Robert K. Knake offer a vivid, engrossing tour of the often unfamiliar terrain of cyberspace, introducing us to the scientists, executives, and public servants who have learned through hard experience how government agencies and private firms can fend off cyber threats. Above all, Clarke and Knake show us how to keep the fifth domain a humming engine of economic growth and human progress, not give in to those who would turn it into a wasteland of conflict. Backed by decades of high-level experience in the White House and the private sector, this book delivers a riveting, agenda-setting insider look at what works in the struggle to avoid cyberwar.